Many of today’s coffee makers, including Keurigs, contain computer screens, sensors, and other delicate components that can easily malfunction. The following guide will help you troubleshoot some of the most common issues affecting Keurig coffee makers. 13. How Do I Unclog a Keurig? 15. How Do I Descale My Keurig? 17. How Do I Reset My Keurig? 18. How Long Is a Keurig Warranty? 19. How Do I Contact Keurig Support? 20. How Do I Find an Authorized Keurig Repair Center? The first step is to make sure that the machine is plugged in. If so, unplug and replug your Keurig and press the power button. If that still doesn’t work, try plugging your machine into a different outlet to see if that resolves the issue. It is also a good idea to make sure that all of your circuit breakers are in the “on” position. If your machine still does not power on, you should contact Keurig customer care. There are several problems that may keep your machine from brewing. If you use your machine regularly, it may need to be descaled to remove calcium buildup. Grounds may be clogging the dispensing line. These can usually be removed using a paper clip or by using a straw to blow air through the line. Air bubbles trapped in the machine may be interfering with the brewing. This situation can normally be corrected by powering off and unplugging your Keurig, filling the water reservoir, and then giving the machine a couple of gentle shakes. Some of the machine components may not be aligned and seated correctly. Make sure that you are giving your Keurig plenty of time to warm up before attempting to brew. This problem is most likely caused by a clogged water line. The follow steps will help you troubleshoot a situation where your Keurig only brews a half cup of coffee. Make sure that the water reservoir has sufficient water and follow the steps for removing air bubbles from the line. Make sure that the vibrations from the machine have not dislodged the magnet on the water reservoir. Wipe off the puncture needle to remove any grounds or debris. Run your Keurig through a few brew cycles using only water to try to flush the lines and coffee outlet. If the above steps do not solve the problem, try descaling your machine following the manufacturer’s instructions for your model. This usually occurs when the gasket that surrounds the puncture needle does not form a complete seal with K-cup. This allows the incoming water and grounds to seep out and create a mess all over your counter. You should try replacing or realigning the gasket by moving it down a quarter inch so that it creates a tight seal between the puncture needle and the K-cup. If your machine starts brewing on its own, you may have inadvertently set the built-in timer. You should consult the operator’s manual for your particular Keurig model for instructions on deactivating the timer. The Keurig Mini is set to turn off automatically after 90 seconds of inactivity. You can start it again by pressing the “Power” button. The Keurig Elite will switch off two hours after brewing if the green “Auto Off” light is illuminated. You can deactivate this feature by pressing the “Auto Off” button until the green light is no longer illuminated. If you have not switched coffee brands, this is probably an indication that your machine needs to be descaled. The more advanced models alert you when it is time for descaling; however, you may need to do it even more often if your machine gets heavy use. This is usually a sign that there are grounds on the exit needle. To remedy this, remove the pod holder assembly and detach the funnel. You can then insert a paper clip into the exit needle located at the bottom of the pod holder assembly to remove any grounds or debris. The needle is sharp, so you should avoid touching it with your fingers. If you are brewing with a refillable K-cup filter, be sure that you only use coarse ground coffee. This will prevent the grounds from passing through the mesh filter. The first step is to “burp” your Keurig. To do this, you should power off and unplug your machine and remove the detachable drip tray and water reservoir. 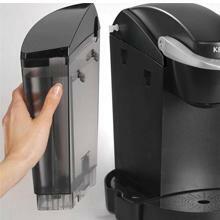 Next, give your Keurig a firm slap midway up the side of the machine where the water reservoir attaches to the body. Do not forget to hold the machine on the other side so that it does not get knocked over. Replace the drip tray and water reservoir and run a brew cycle using water only. If this does not work, you should contact Keurig customer service. You can try to fix the problem with the following steps. Turn the water reservoir upside down and give it a few shakes and taps on the bottom. Replace the water reservoir and attempt a brew cycle. Descaling your machine may also help solve the problem. If this does not work, contact Keurig customer service. Your Keurig can take up to three minutes to preheat. If you try to rush the process, your machine will not brew properly. If your Keurig will not dispense water after being allowed to preheat, follow these troubleshooting steps. Make sure that there is adequate water in the reservoir and that the reservoir is firmly attached to the unit. 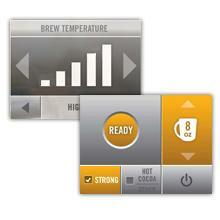 Make sure that the handle is in place and that the brew settings screen is showing. If nothing happens after five minutes, contact Keurig customer service. This is a very common problem with the latest generation of Keurig brewers. There is little that you can do other than to unplug and plug the brewer in again. If it only happens once or twice, it may just be a temporary glitch. If the problem persists, you should contact Keurig customer support. This is usually a sign that the exit needle is clogged. Try removing the pod assembly and cleaning the exit needle with the tip of a paper clip. If this does not solve the problem, you should contact Keurig customer support. The needle that pierces your K-cups is hollow and can easily become clogged. When this happens, the water will drip through slower than normal. The problem is easily solved with a paper clip and a little vinegar. Lift the lid like you were going to insert a K-cup. The piercing needle is located on the underside of the lid. Insert a paper clip or toothpick into the opening in the needle to loosen any grounds or debris. Fill the water reservoir with vinegar and press brew. Shut off the machine just before it would start to drip and allow it to sit overnight. The next morning, press brew so that the machine can finish the cycle. Repeat the brew cycle until the water reservoir is empty. Run several cycles of clear water through the machine to remove any vinegar residue. A “Prime” error message on a Keurig brewer indicates that the machine is unable to access the water in the reservoir to prepare the boiler unit for brewing coffee. A common cause of this problem is an air pocket that blocks the flow of water between the reservoir and the pump intake. The first step is to unplug your brewer, empty and refill the reservoir, and plug the machine back in after allowing it to sit for a few minutes. This can help break-up the air bubble so that the water can flow properly. Before you refill the reservoir completely, you can also try pressing the check valve on the underside of the reservoir. You should do this over the sink with a small amount of water in the reservoir. Start by powering off your Keurig, emptying the water reservoir, and removing the water filter. Pour a bottle of descaling solution into the water reservoir and add water to the max fill line. Make sure that the pod holder is empty, place a cup under the dispenser, and power on the machine. Select the 8-ounce brew size and press “Brew.” Discard the contents of the cup and repeat the process until the reservoir is empty or you get the “Add Water” message. Let the machine cool for 30 minutes with the power on. Wash the water reservoir thoroughly and perform as least 12 cleansing brews to remove any vinegar residue from the brewer. Start by making sure that the water reservoir is filled to the max fill line and that it is securely in place. If this does not work, try washing the reservoir thoroughly. Refill the clean reservoir and return it to the machine. If the problem persists, contact Keurig customer service. One downfall of Keurig brewers is that there is not a simple reset button or procedure. In many cases, your best option is to contact Keurig customer support for assistance. If your Keurig is displaying a “Not Ready” message, follow these steps to try to reset the system. Unplug the machine and wait for approximately five seconds. Plug in the machine. You should get the “Add Water” message. Hit the menu button rapidly until you see “Menu” at the bottom of the screen. Try to brew as you normally would. You can also try the following method. Power off and unplug the machine. Plug in the machine as you press and hold the power button. Try to brew a cup of coffee as normal. You may have to repeat the procedure several times. Keurig warrants their machines for normal home use for one year from the purchase date. If your machine should fail during that time, Keurig will repair or replace the machine at no cost to you. The warranty does not cover abuse or misuse of the machine, damages caused by anyone attempting to service the machine other than an authorized service provider, use of non-Keurig parts, or incidental or consequential damages resulting from a defective machine. You can also contact Keurig support through their online contact form or by mail at the following address. You should contact Keurig at 1-866-901-2739. Keurig’s customer support department will give you instructions for mailing in your machine for repair or the location of your nearest authorized repair center. Attempting to repair your Keurig yourself or by taking it to an unauthorized repair center could invalidate your warranty. I have a Keurig 2.0 and the screen stopped working so I did the troubleshooting and it still did not work so I called the support line and said all the could do was offer me a 20% discount and i was not interested in that because I’ve only had this product for six months and sence I didn’t have the receipt that’s all she could do so I’m not very happy with Keurig! My Keurig takes so long to brew a cup of coffee. It will start pumping and does pump but the water drips, and drips, and drips. It says brewing, hot. Do not lift and shows the drip on the display. I have changed the filter, descaled it, and cleaned the grounds. What else can be done?